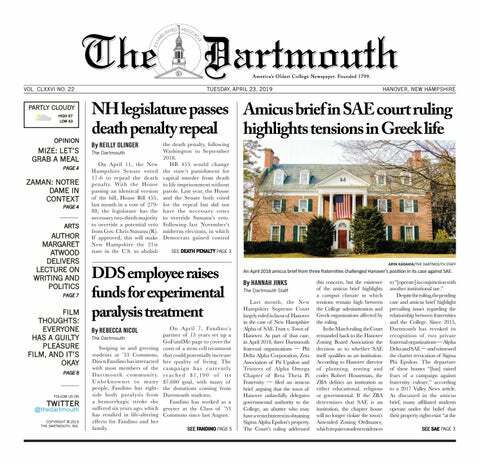 According to the Hood’s campus engagement coordinator Isadora Italia, with the museum’s increase in size, it is hoped that the influence of the Hood on the Dartmouth community will grow commensurately. Deputy director of the Hood Juliette Bianco said that there were extensive expansions to the museum. In addition to increasing the number of galleries from 10 to 16, they have addded the Bernstein Center for Object Study for Dartmouth classes and a spacious 2,500 square foot atrium with spaces for students to study and relax. The atrium, connected via walkway to the Hopkins Center for the Arts, is at both the architectural and conceptual heart of the new Hood. With the same opening hours as the Courtyard Café, the atrium will remain open even as the galleries are closed, providing students with an additional area to sit, study, read or eat. As such, the Hood will not only operate as an art gallery, but as another hub for activities on campus, beginning with the student “after hours takeover” opening party on Jan. 31. Complete with food, live music and a photo booth, the party will inaugurate the Hood as Dartmouth’s newest alternative social space. Meeting the needs of the Dartmouth community seemed to be the impetus behind the renovations from the very beginning. As the Hood’s utility grew, so too did the shortcomings of the original design. Thus, the museum was remade to accommodate Dartmouth courses, community events, K-12 classes and other such activities for which the old building was not suitable. However, the renovations were not without their fair share of difficulties. Still, much of the former architecture of the Hood is preserved. The Lebanon Street entrance of the museum retains the facade of the original Hood. The nine galleries of the back end were rebuilt to match the old specifications, while the seven newly designed galleries sit nearer to the Green. “We combined the original and expanded parts of the building to create a seamlessness inside, so you feel like you’re in the Hood Museum of Art, and not two different buildings,” Bianco said. Like the architecture of the building, the exhibitions were also given careful attention. The opening exhibits display the Hood’s permanent collection. However, rather than the European art collection comprising the central gallery space, the Native American and African art collections are placed at the forefront. Dartmouth students expressed their excitement at the Hood’s diverse collection. Another student was happy to have more room for activities on Dartmouth’s modestly-sized campus. “I am excited for another study location in that area of campus. It will be a fun space to go to when I have free time,” said Honora Verdone ’20. Overall, the new Hood will not just be a gallery but an important addition to campus, fostering intellectual, cross-cultural and social engagement. Claudia Bernstein is a member of The Dartmouth Staff.